Arm Candy is is a figure-conscious, elbow-sleeve pullover trimmed with seed stitch. For stability and structure, I recommend that it be knit flat in pieces, and seamed together. The wide, deep V neckline is trimmed in seed stitch neck bands that are overlapped and sewn in for a tailored touch. 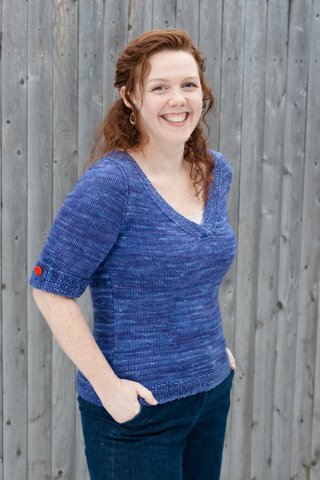 The sleeve cuffs are knit separately to allow for some shaping and sassy button detail. You might find that your gauge in seed stitch differs from your stockinette gauge; if this is the case go down (or up) a needle size for the seed stitch trim. Arm Candy will work well at nearly any gauge, though the cuffs may get bulky in a yarn heavier than aran weight. Sundara Yarn Aran Silky Merino [50% merino wool, 50% silk] (200 yds/183 m per 100 g hank), shown in color “Wild Blueberries”.